"Joe’s artwork is collected internationally, earning a number of awards for both art and photography in recent years." 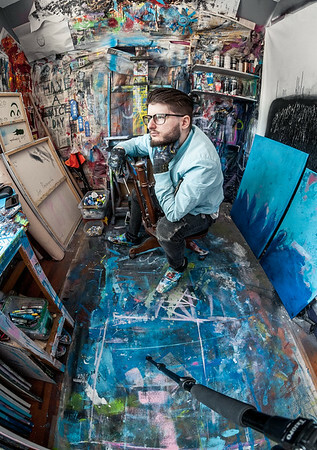 - Princeton Artist Brush Co.
"Combining talent in art with some business savvy, Joe Papagoda is making a name for himself in the art world." "Joe Papagoda, an accomplished young artist living and working in North Haven, Connecticut, is gaining greater attention now for blazing new conceptual frontiers." Prolific, accomplished, and a person of many things - The works by Joe Papagoda are collected across the USA, and abroad. Although a majority of Joe's artwork is formed in a fluid & organic manner with color dominated arrangements of erupting color & hidden details - he also creates dramatic photographs, occasional clay sculpture pieces, and semi-abstract figure paintings - subverting the common concept that artist's are only ever recognized for a single approach. Additionally, his artworks are often paired with poetic titles to create a sense of mystery, and narration that allows the viewer’s mind to wander further into the conceptual meaning of the artwork. Joe has also been commissioned by the Tilden Hotel in late 2016 to create an original artwork to be transformed into a 65 x 35 foot printed mural that will be visible throughout the whole hotel. In 2016 he also began to offer exclusive limited edition fine art prints of his abstracts and select originals with ArtStar.com. in 2017 Joe was also invited to lecture on the topics of art, photography, social media marketing, and to review AP student portfolios with Nepris inc. Joe’s approach to art is not in conformity to the common milk-and-water approaches. He has elected to become his own authority and keep with his divergent ability and advances with his own hallmarks and tends to dismiss even the formal approach to art creation and rather works authentically in his own manner while combining mediums with the intent of inspiring others. • Fine Arts Series Spring Exhibition, North Carolina School of Science and Mathematics. Durham, North Carolina. • Gallery For Broken Hearts, Code and Canvas, San Francisco, CA. • Fare Thee Well, The Arts Center, Corvallis Oregon. • Post-Presence, RayKo Center, San Francisco, CA. • Twitter Art Exhibit, Stratford ArtsHouse, Warwickshire, United Kingdom. • Group exhibition, 31st Annual Juried Fine Art Show, Louisville Art Association, Louisville, CO.
• Group exhibition, Spring Show, Academy of Art University Warehouse, San Francisco, CA. • Group exhibition, Twitter Art Exhibit, Trygve Lie Gallery, New York, New York. • Group exhibition, 5th Annual Square Foot show, The Arts of Life inc, Chicago, Illinois. • Group exhibition, Star Wars: The Exhibit Online Show, Artist Mafia, Las Vegas, Nevada. • Group exhibition, The Average Joe Photo Show, Lori Warner Studio Gallery, Chester, Connecticut. • Group exhibition, Star Wars Awakening Art Show, Red Lion Pub, Winter Park, Florida. • Group exhibition, Autumn Colors Exhibition, Focus Point Shape International Online Art Gallery. • Abstract Exhibition, Focus Point Shape International Online Art Gallery. • Group exhibition, Portraits Exhibition, Focus Point Shape International Online Art Gallery.